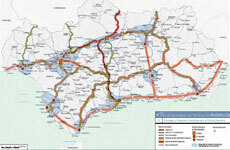 According to territorial and infrastructural planning in Andalusia, as well as to the proposed definition for the Mediterranean Corridor, this paper aims to explore, as its title indicates, the prospects for territorial development linked to the future high-performance rail lines in Eastern Andalusia. This is within the general objective of improving the territorial integration of future railway infrastructures in the planning stages, in the network of cities in Eastern Andalusia in order to take advantage of all its local potential and, in short, to increase its territorial capital. Thus, in relation to other experiences and to the existing socio-economic reality, the processes of contraction of space are determined that will promote the new networks and the forecast of their territorial incidence. Future strategies are proposed around the new railroads for the proper use and stimulation of local potentials, the minimization of the tunnel effect and its polarizing consequences on the territory. In addition we consider the establishment of proposals for the optimization of the positive territorial impact of future rail corridors, with the proposal of spaces of logistic opportunities, to establish actions for intermodal coordination and with future territorial projects, etc.